I am going to use HTML5 and AJAX from jQuery to build the interface. I will create two files an index.html file for the interface and a box.css file for the css3 to draw the popup box. 2. Starting with the HTML. I need to create the popup html and the stock codes html that the user will hover over with the mouse. This code is hidden until a stock quote is to be displayed. It is the place holder for the HTML that the JSP template generated and it is this HTML that will be append to the ‘contents’ div tag. 3. The css is used to give style to the popup and to show and hide it. There are only two styles. The openBox gives the popup all its style; its height and width, color and transition qualities. The CSS is in a separate file call box.css that I import into the HTML. 4. I use jQuery’s implementation of AJAX. First I need to import the jQuery library. Then I configure the AJAX call. // When the mouse hovers over the link this event is launched. // Called on the mouse in event. // Called on the mouse out event. 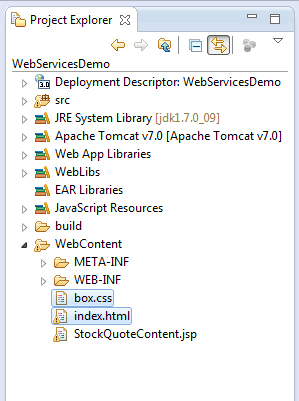 This just about wraps up this short step-by-step guide to setting up a web application using a Webservice. HTML5, CSS3, jQuery and AJAX for the interface and communicating with the server. Servlet, JSP and Tag Libs to handle the request/response and generate the template. JAXB to un/marshal the XML returned by the web service. SOAP and WSDL to set up and communicate with the web service. The server used was Tomcat 7 and the IDE Eclipse Juno. I hope you have enjoyed this little demo and please leave any comments below.